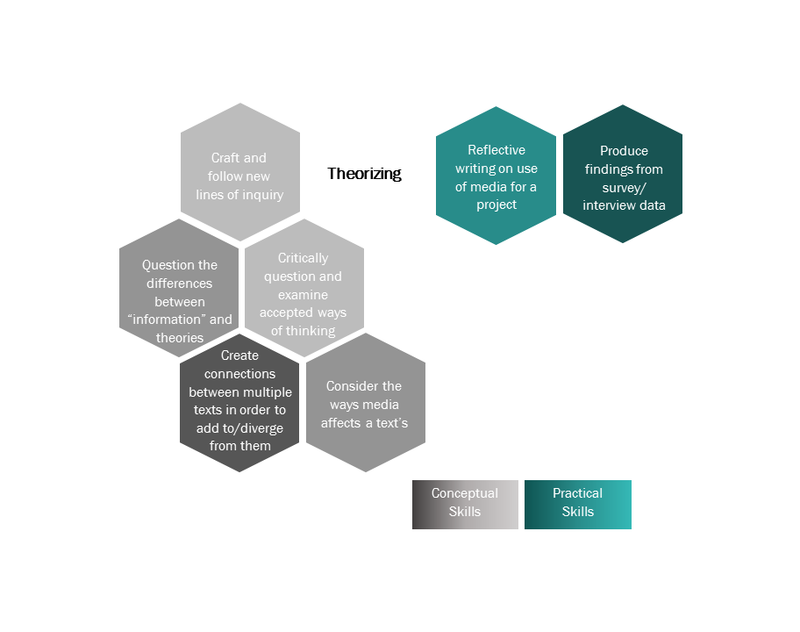 This tool is intended for use by instructors who have an idea of what they would like their course inquiry to be and a rough idea of what their assignments may entail, but would like to further explore how this inquiry might work in the Writing Across Technology curriculum. 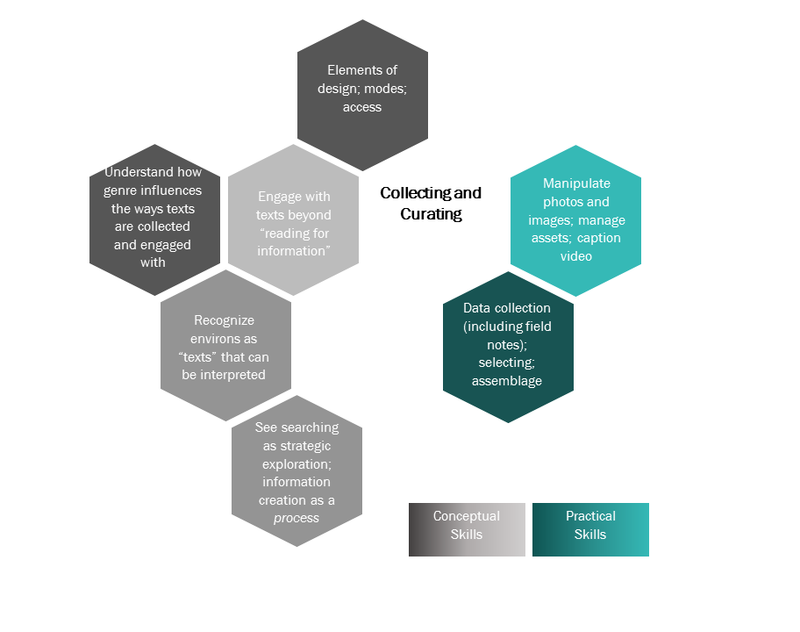 It provides one structure for developing a course through the new curriculum - instructors may find that brainstorming their course through other means and in different directions first before going through this tool may work best for their teaching practices. The terms used in this form are not meant to be prescriptive, but, rather, the learning objectives, architecture, and course moves we have developed describe practices we all engage in while composing across media and genres. In part, then, our goal is to make these practices visible. There are three main aspects to the Writing Across Technology curriculum: click the headings below to learn more about our learning objectives, architecture, and course moves. The Writing Across Technology curriculum includes five major learning objectives that students will develop throughout the course. In essence, these objectives are the things students should be able to do by the end of the course, and will affect the way students engage with composition broadly and long-term. There are many ways to achieve these outcomes, and individual FYW courses are structured differently and reach these goals in various ways. Architecture refers to the development of a course throughout the semester. 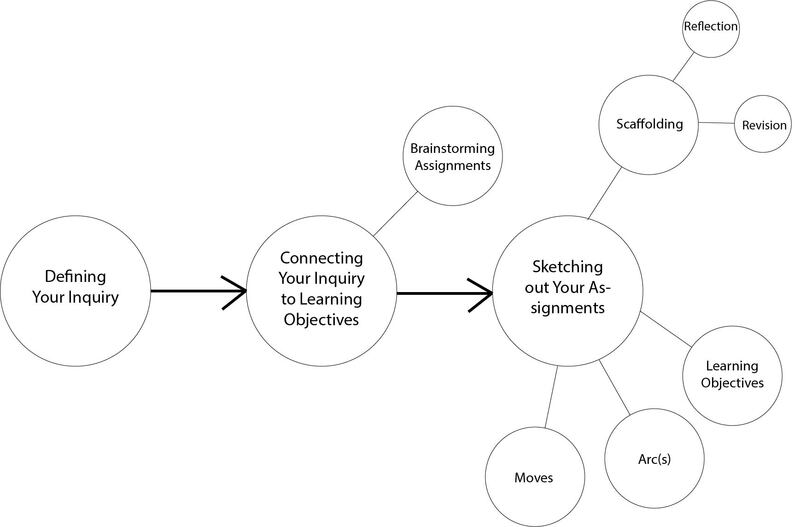 It is a general "map" of how a course inquiry will proceed. The Writing Across Technology architecture includes three "arcs." Unlike our course moves, arcs develop chronologically. Each arc scaffolds new ways of thinking and composing. If the architecture is a "map" of your course, each "arc" represents a different portion of the "route." Arcs are not "units"; where units are typically distinct and are defined by content, arcs instead overlap and scaffold on one another. They are defined by the types of thinking and composing students are doing and how the course might build on each other. Each should build on the last, and some assignments may serve as "bridges" between each arc. "Grounding" is where we see students beginning to get their bearings both in foundational (sometimes called “threshold”) concepts and practices in terms of the conceptual work they will do as well as the writing practices they will be working on during the semester. Often, Grounding asks students to explore the inquiry in a more immediate or familiar context, and recognizing themselves as cultural, social, etc. subjects. “Connecting” offers students opportunities to reframe experiences in a new light and to speculate on associations among ideas, texts, methods, modes, exhibits, and arguments. They may take what they've begun to explore in their foundational work while Grounding and start Connecting that work to issues in larger, but still familiar contexts. By asking students to see their work as “Opening Outward,” we encourage them to imagine new occasions and environments for their texts, new modes and registers to present their work in, and new perspectives and motivations for continuing an inquiry after the course ends. Often, Opening Outward might mean Connecting to and expanding on large-scale conversations and contexts beyond the classroom and university communities. Although these arcs are laid out in this order, instructors are not required to necessarily develop the arcs linearly between Grounding, Connecting, and Opening Outward; the work of some courses may begin in larger contexts before remagining one's own cultural subjectivity, for example, or some assignments may work in more than one arc. Primarily, these arcs represent the development of the semester over time (although we recognize that writing does not always necessarily develop in a neat, linear progression). We’ve structured our curriculum in terms of five “moves,” by which we mean five actions or practices of writing. What's the difference between learning objectives and course moves? Learning objectives will fundamentally change the way students approach composition throughout and after the course. Course moves, instead, are actions and practices that we engage with strategically depending on the work of each assignment. You can learn more about each of these moves here. When we write, these moves are not altogether distinct, nor are they the only actions we take while writing. Instead we see these moves as interwoven, overlapping, and mutually constitutive. The order presented below is not meant to be prescriptive, as experienced writers rely on different methods, processes, and ways of thinking. 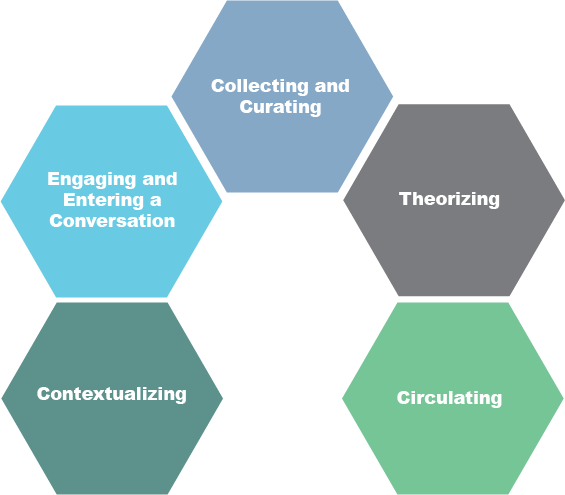 This infographic shows the five course moves in hexagonal shapes: Collecting and Curating, Engaging and Entering a Conversation, Contextualizing, Theorizing, and Circulating. Collecting & Curating refer to the practices of strategic observation or active “noticing,” and a move toward making something meaningful from the collection. Engaging and Entering a Conversation is when writers look for ways into a conversation, consider ways to put the text to use (rather than reading for information that would be re-presented), and formulate how they might make a contribution. Writers are Contextualizing when they situate a text among others that are in the conversation, but also when they consider a text in terms of its history, values, assumptions, and its ways of presenting or ordering the world. Theorizing involves accounting for the reasons for a phenomenon, changing the terms of an argument, investigating what others have bracketed out of sight. It constitutes a contribution to the conversation, method, and the new knowledge the student produces in the course. 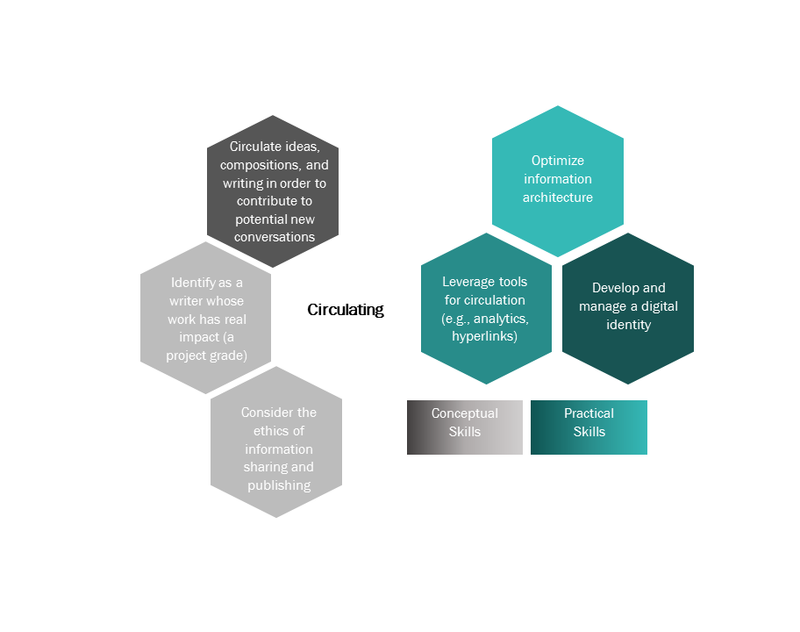 Circulating is when our students' work finds audiences not previously accounted for as their texts are distributed and their knowledge networked. Students’ digital literacies are a significant focus when working through how texts circulate and the consequences of those circulations. This tool is intended to help instructors ensure their course inquiry achieves curricular goals of the Writing Across Technology initiative. On each page, you will need to complete each section fully in order to advance to the next page. You may save your progress at any time by clicking the "Save and Continue Later" link at the bottom of each page (the whole page does not need to be completed to do this; the tool will remember which fields you filled in already). This field as well as the fields above describing the curriculum will remain at the top of the page as you progress. If you'd like to review any of these, you may simply scroll up as you work. The tool will first ask you about the relationship between your course inquiry and the WAT learning objectives. Afterward, it will ask you to provide overviews of each assignment. On each page, you may describe the assignment as best as you are able to at the moment. You will then be asked to select which arc the assignment will take place during; when you do so, a brief reminder of what each arc entails will appear. Similarly, you will be asked to describe which course move the assignment will primarily engage. When you pick a course move, a reminder of that course move will appear, as well as a link to a full description of that course move with sample assignment ideas. You will then be asked to select which other course moves students might be engaging with in the assignment (this may happen in the major assignment or in its scaffolding assignments). Your course must use all of the five course moves, whether in its scaffolding assignments or in the major assignments. 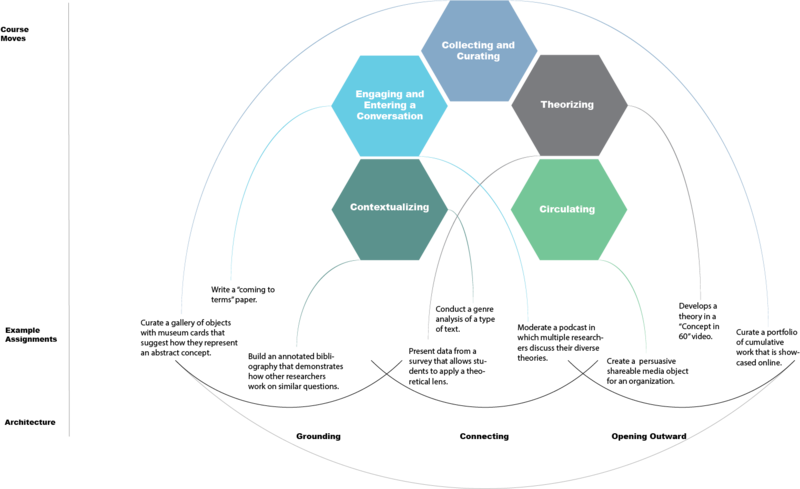 The infographic is a series of bubbles representing each portion of the form, beginning with "Defining your Inquiry," then, "Connecting Your Inquiry to Learning Objectives" with a smaller bubble titled "Brainstorming Assignments," and finally "Sketching out Your Assignments" with several smaller bubbles, including "Moves," "Arcs," "Learning Objectives," "Scaffolding," "Revision." and "Reflection." When you finish and submit the form, you will automatically receive a full copy of your responses to your email. Your responses will also be saved to the website. If you have questions, please contact firstyearwriting@uconn.edu. If you would like to see an example of a course designed using the course development tool, see "Sample Course Design." This tool was developed by Alex Gatten, Gabriel Morrison, Lisa Blansett, David Des Armier, and Brenda Brueggemann. Often, it can be helpful to think of our inquiries as questions, so we can develop our courses as mutual sites of exploration (as opposed to top-down delivery/mastery of content). In other words, what is the relationship between this inquiry and writing/rhetoric? As a project-based course, we ask our students to write through questions that help them generate new knowledge, see themselves and rhetorics in the world differently, and so on - how will this question make room for your students to explore and engage with these stakes? How does your course inquiry allow students to approach composition as a complex process? What might be an assignment idea that allows your students to develop this learning objective? How does your course inquiry allow students to identify themselves as writers? What might be an assignment idea that allows your students to develop this learning objective? How does your course inquiry allow students to engage with a conversation? What might be an assignment idea that allows your students to develop this learning objective? How does your course inquiry allow students to critically examine ways of knowing? What might be an assignment idea that allows your students to develop this learning objective? How does your course inquiry allow or make space for students to use technology rhetorically? What might be an assignment idea that allows your students to develop this learning objective? Descriptions should include the purpose, audience, and genre (as distinct from mode - e.g. literacy narrative, documentary, literature review, presentation, etc.) of the assignment. "Grounding" is where we see students beginning to get their bearings both in foundational (sometimes called “threshold”) concepts and practices in terms of the conceptual work they will do as well as the writing practices they will be working on during the semester. 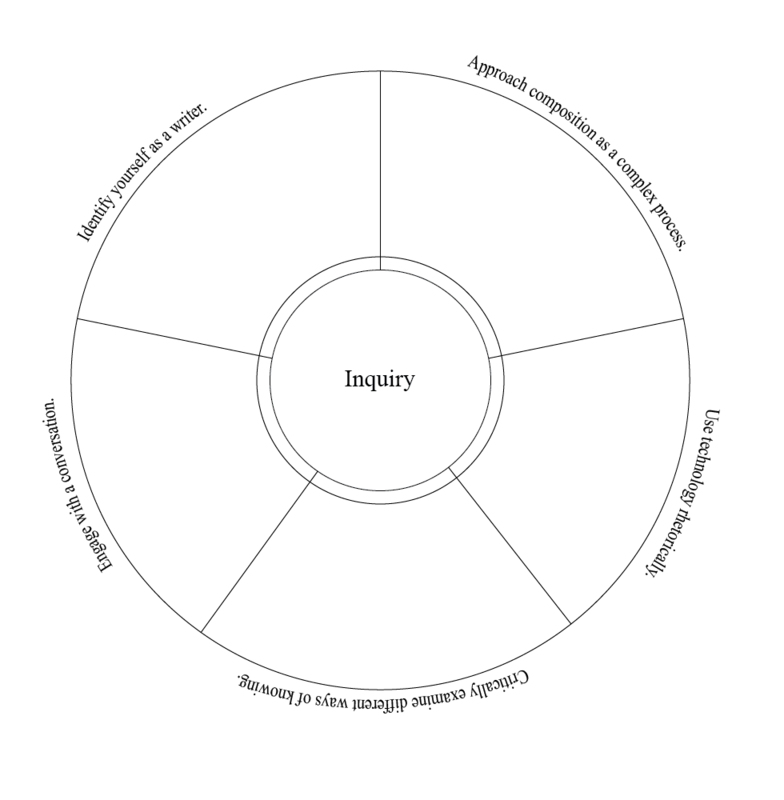 Often, Grounding asks students to explore the inquiry in a more immediate or familiar context. The arc we call “Connecting” offers students opportunities to reframe experiences in a new light and to speculate on associations among ideas, texts, methods, modes, exhibits, and arguments. They can take what they've begun to explore in their foundational work while Grounding and start Connecting that work to issues in larger contexts. By asking students to see their work as “Opening Outward,” we encourage them to imagine new occasions and environments for their texts, new modes and registers to present their work in, and new perspectives and motivations for continuing an inquiry after the course ends. Often, Opening Out might mean Connecting to and expanding on large-scale conversations and contexts beyond the classroom and university communities. What is the major course move your students will be engaging with? Which learning objectives will this assignment encourage students to meet? Please briefly list what modes the project will be in and the technology or tools involved. Describe the scaffolding assignments you imagine for assignment 1 and how they will build up to the larger assignment. Will the scaffolding assignments address their own course moves or learning objectives? Revision may include in-class workshops, peer discussion, conferences, etc., as well as particular drafts. Some options for reflection include: low-stakes in-class writing, process notes, or asking students to reflect in the assignments themselves. Describe the scaffolding assignments you imagine for assignment 2 and how they will build up to the larger assignment. Will the scaffolding assignments address their own course moves or learning objectives? Describe the scaffolding assignments you imagine for assignment 3 and how they will build up to the larger assignment. Will the scaffolding assignments address their own course moves or learning objectives? Describe the scaffolding assignments you imagine for assignment 4 and how they will build up to the larger assignment. Will the scaffolding assignments address their own course moves or learning objectives? As a reminder, when you click "Submit," you will automatically receive a copy of your responses to your email. Additionally, First-Year Writing will also automatically receive a copy of your full responses. Please contact firstyearwriting@uconn.edu if you have questions. Thank you for using the Course Architecture Tool.